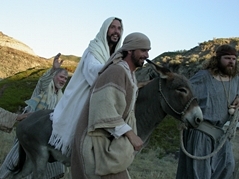 The Canadian Badlands create a stunning backdrop for triumphal entry as portrayed in the Canadian Badlands Passion Play. Mike Begg plays the apostle Thomas, D'Arcy Browning plays Jesus Christ, Dean Matheson is John the Beloved, and Brad G. Graham works as technical director. Photo: Randall Wiebe. Although are mostly famous for their dinosaur fossils, the Canadian Badlands near Drumheller, Alberta, are now drawing thousands of people for another reason: the Canadian Badlands Passion Play, a large-scale retelling of the life of Christ that was recently voted Alberta’s top cultural attraction by Attractions Canada. The play, while only running for two weekends in July, is expected to draw approximately 16,000 spectators this year to the natural ampitheatre that houses it in the unique geological setting which organizers say resembles Israel’s landscape. More than 2300 people were expected to attend each of the play’s first showings July 12-16. LaVerne Erickson, the founder and general manager of the play, was unsure the idea would fly when he first discussed it with Drumheller city directors nine years ago. “We told everyone ‘don’t get your hopes up, this is just a pilot project.’ It’s such a big concept that people didn’t believe it would happen,” Erickson told the Drumheller Valley Times in early July. But Erickson is used to big projects. He also founded the Rosebud School of the Arts, which runs Rosebud Theatre, a company with significant Christian links. Morris Ertman, a frequent director at Vancouver’s Pacific Theatre, is Rosebud’s artistic director. The play has grown to include more than 200 actors and a list of 1,000 volunteers, with two professional actors playing the role of Jesus. 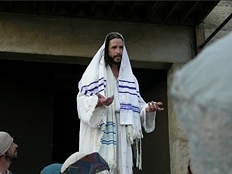 D'Arcy Browning portrays Jesus in the Canadian Badlands Passion Play. Randall Wiebe is playing Jesus for the second time this year, with D’Arcy Browning as understudy, each acting the role in three performances. Wiebe, who lives in Rosebud and owns a graphics design company, says playing Jesus is a “humbling” experience. “I understand Christ to be fully human and fully divine — the one I can relate to, the other I can’t. I try to concentrate on portraying the human side as much as possible, and giving indications toward the divine, instead of falling into the trap of making him partially human so he appears more fully divine,” Wiebe explains.